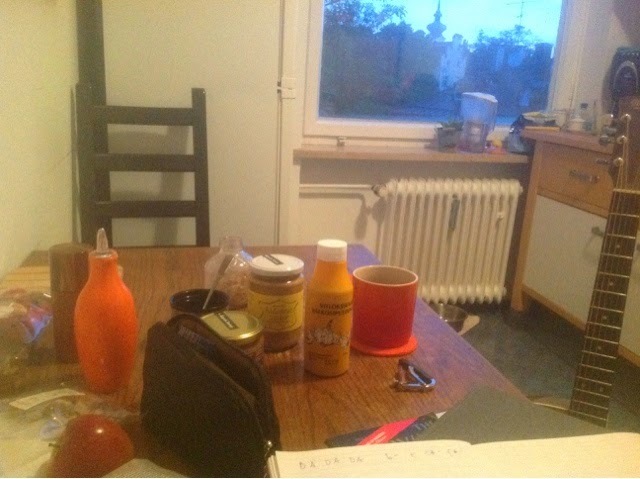 Well, a friend who's recently been galavanting round Finland and other locations oop north has brought me some mustard. Good mustard, even. What sort of tea goes best with mustard? Who would ask such a question? monkeys and tea? what's the deal, yo? It's almost Christmas, which means I should probably be writing a holiday-themed blogpost, but that'll simply have to wait. This is NOT a holiday-themed blogpost. I'm irritable and frustrated and don't want much to do with either the holidays or humanity in general. So, how am I going to spend the next little while? With a bit of White Monkey tea that I got from Claus Kröger in Hamburg. Why? Because I'm assuming that monkeys enjoy themselves even when the going gets rough. And I'm curious why there are so many monkey-related things when it comes to tea. Oolong-picking monkeys have already played a very central role on this blog when Lisa Galaviz went to the Galleria in hopes of setting the monkeys at the tea shop free. Here's Don't tell her it's not tea for your reading pleasure. And here's Lisa's update on the topic in How can they still be out of monkeys? Just rereading her gem of a blogpost and even a few moments of mine have put me in a bit better mood. Maybe this tea lark isn't so bad, after all. Am living out of suitcases right now while I search for a new flat, which means the contents of my tea cupboard is in my rucksack and in various boxes that're either strewn about the hotel room I'm in or in my friend Wolfgang's extra room. Under normal circumstances, I think a lot about what the ideal tea is for this or that situation. Lately, I've simply grabbed the nearest sack of tea and brewed up. Sometimes, it's been the dregs of a shipment of Assam Mangalam, which is one of my favourite teas to drink in the morning or other times it's been the Ambagastowa Ceylon, which I got from a new supplier in Reutlingen (Spezialitäten-Compagnie). However, what I've been a bit surprised at is that I keep reaching for really excellent Darjeeling. I should blog about each of these teas in detail, but I don't have the time for that at the moment. As it is, I found in the past that when the weather was cold and snowy, I didn't avoid tea from Darjeeling, but I didn't gravitate toward it, either. While I was in Hamburg a few months ago, I got a few really nice Darjeelings from both Teehaus Shila and the first tea shop I used when I got into drinking this stuff in earnest - Claus Kröger. It's very unlikely that I'll do a traditional tea review of any of these teas (I've simply decided not to waste my time with that ridiculousness anymore), but I do hope one of my upcoming posts can go into more detail about these particular teas. If I'd like to get back into the habit of posting here on my teablog, I could do with a topic or two that I'm passionate about. Darjeeling tea has never done me wrong on that front. This has not been the easiest of months. I've been very busy, and there's not much time for anything except for the most essential daily functions. I go to work and I read the paper and I try to be relatively nice to the people around me, but it's not always easy. The last few weeks has included a lot of apologising for being a jerk. By me. It's been me. I've been a jerk. Although I could blame the stress in my life, I'm not going to. I'm going to take responsibility and simply say that I'm frazzled. What helps in the middle of a particularly overwhelming moment? Normally, when I'm living in a stable environment, I've got a tea cabinet. However these days I'm living out of suitcases, so presently I've got a tea rucksack. It's my hiking pack and the best use I had for it when I was packing was to cram in all the books and all the tea paraphernalia, as well as much of the tea that I've got, into the said hiking pack. So, until further notice I've decided to make myself very mobile. On the run, if you will. Have no idea where I'll be living next year...much less next month. I'll be ok. Don't want to cause you and concern. Really. 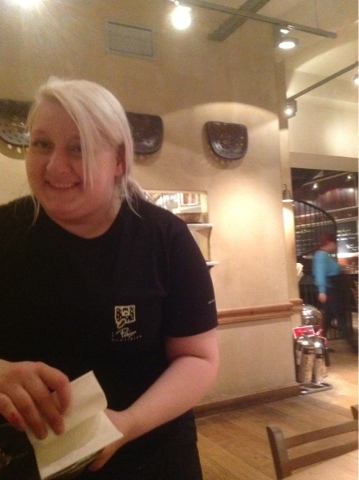 No need for a photo of said rucksack. You know what one looks like. Imagine mine brimming to the surface with tea and tea-related stuff. It's a rather practical way to transport one's tea. 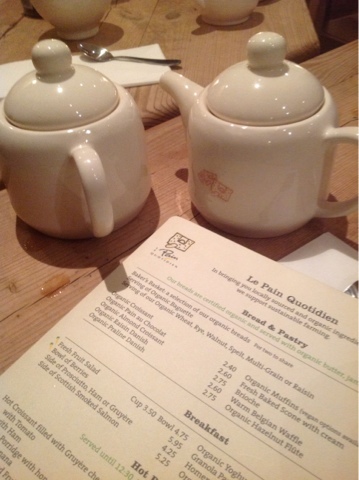 Late in the evening in Notting Hill, some friends took me to Le Pain Quotidien for tea. The waitress listed Earl Grey, English Breakfast and Rooibus as black tea, and I quickly decided on the Pot of Fresh Mint Tea. It was delicious. And so late in the evening, it was nice to know that the natural lack of caffeine wouldn't interfere with my drifting off to sleep. Actually, I'm doing that right now. Well, although Germany's primarily a coffee-drinking culture, there are pockets of the country that're are hotbeds of tea drinking. One of those places is the region in Germany on the northernmost part of the Dutch border called Ostfriesland. I've talked about them before on this blog and I continue to find the tea that the people in Ostfriesland drink, as well as the way they drink it, to be fascinating. For example, there's an Ostfriesland Teezeremonie (tea ceremony) that really needs to be written about. What a perfect opportunity for a teablogger such as yours truly. I'll write about that at some point in the future. Anyone interested in a German tea ceremony? Ok, I'll get to that as soon as I'm able. Xavier and I haven't known one another for such a long time, but we're fast friends. Not sure where that term comes from, but I don't know of any faster friends. We met last year in the summer when he came to Munich for the First Annual Tea Trade Convention, and I saw him at New Year's when he and Sabine came to Nice at the same time my wife and I were there. I've documented all of this here on my teablog, but I thought I'd give you a quick synopsis of our backstory. Xavier and I have spent much of our time together either drinking or talking about tea. He's one of the many tea people I've found as a result of teablogging, and he quite possibly might be the most important. He's just some French dude, right? Not exactly. 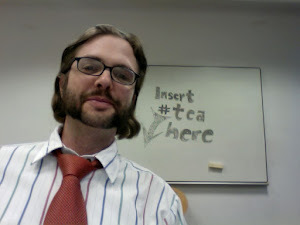 He's one of the best teabloggers I know, because he does a niche thing that no-one does quite the way he does. Xavier writes about tea and business. It's intriguing what he writes about. Every single time I read one of his posts, I learn something I'd never even considered before. Every. Single. Time. If you don't know TeaConomics, you should. I'll write about the tea another time, but I can tell you that it's going to be available soon. If you like the things that they do over at the Le Palais des Thés, you're going to love what I have to tell you soon. It's an entirely new line of tea blend. Four blends this year and then two more next year and two more the next. 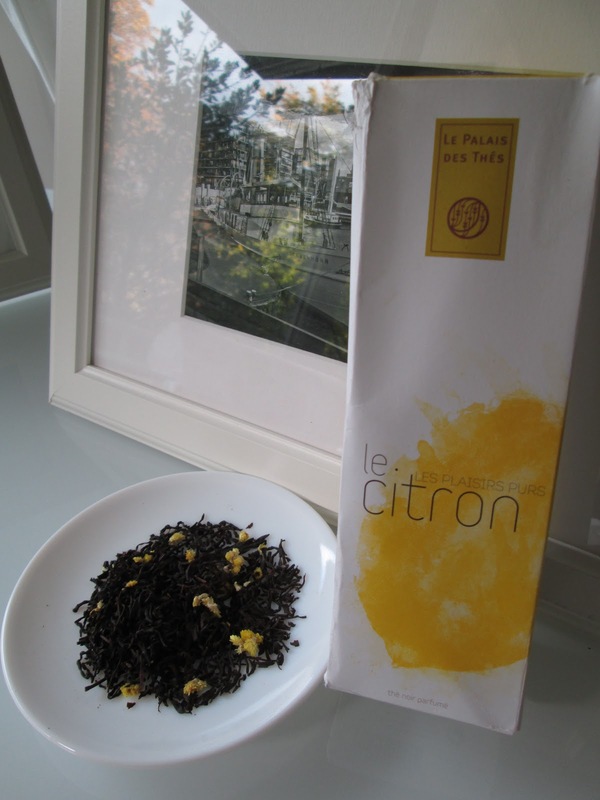 That means that by 2014, you can get one of eight exceptional tea blends from Le Palais des Thés. I'll review the four that're coming out this year as soon as they're available. 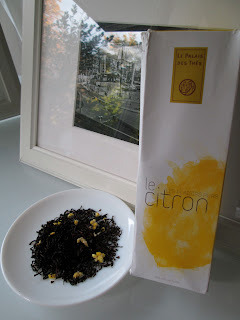 Xavier and I had le Citron yesterday, and we both liked it quite a lot. More on that soon.